“Carmageddon” came and went, and a slightly diminished 16th Pacific Coast Open went into the books. The weekend closure of the portion of the San Diego Freeway that connects the Westside of Los Angeles to the San Fernando Valley (a quintessential “vital artery”) failed to generate the feared massive traffic jams – because many drivers wisely stayed home. The tournament at the Renaissance Hotel in Agoura Hills (just beyond the west end of the Valley) drew about 30 less entrants than last year, a result attributable to the traffic situation, but the turnout of 182 players (plus four reentries) was still respectable, and 80% of the based-on prize fund was paid. Of course, the real story of the weekend was the chess. The 26-player Open section followed the pattern of some recent Southern California events – up to a point. GM Melikset Khachiyan and IM Andranik Matikozyan drew quickly in the fifth round, as did IM Enrico Sevillano and his stepson, FM John Bryant. Matikozyan and IM Enrico Sevillano split the point instantly in the final game. Khachiyan and Sevillano had turned in a more hard-fought draw in the fourth round, with a strange double oversight. Enrico’s 18th move appears to blunder a piece, but both players apparently appraised 19.Bxc6 Nxc6 20.Qxc6 Rd5 (or 20…Bb7 21. Qb5 Qxb5 22.Rxb5 Ba6 23.a4 and White’s on top) 21.Rb4 Bb7 22.Qa4 Qc5 as promising for Black. However, simply 23.Rxd4 or 23.Rc4 is winning; the Black queen can go e7-h4, but White defends easily. In the final position, White has plenty of compensation after either 24…Nxc2 25.Bd6+ or 24…d3 25.cxd3 Nxd5 26.f5, so a draw was agreed. Sevillano had a key win against IM Zhanibek Amanov, a Kazakh residing in Los Angeles, in Round 3. Opposite-colored bishops often do not a draw make! In this case, Black emerges with a space disadvantage and a passed pawn to confront, and his attempts at counterplay are unavailing. And Matikozyan, who started off with a “Swiss gambit,” drawing with young Expert Tony Yim of Arizona in the first round, had a key tactical win against Bryant in the fourth. In a topical line of the Sozin Najdorf, White retains a slight edge. White missed 29.Nc7! Ng7 30.Qc3 Rc8 31.Qd4 f3 32.Bxe6 Ref8 33.b4 with a good plus, while Black repaid the favor by overlooking 30…Ne3! 31,Qxg5 hxg5, which is equal. 31.Bxe6 was second best (again, 31.Nc7! ), but only 31…Rxe6 32.Qxe6 Qxb2 really prolongs the game, and White’s advantage is clear. The young star of the tournament was 17-year-old Howard Chen of Washington, whose family drove down for the weekend. Sixth seeded, Howard began with a flashy if not completely sound first round win, dusting off the old Colle-Zuckertort opening. Black could have improved with 20…Bxd3 21.cxd3 (21…Nxd3 Ne4) Nc2 eyeing the weak e3 square, or even 20…Bc8. And after the bishop sac, 22…Kxh7 23.Qh3+ Kg8 24.Bxf6 Ng5 25.Qf5 Qxf6 defends satisfactorily. Nice finish, though! Howard lost to Bryant in the third round, but came back with a nice win over Amanov in the penultimate game. The position after move eight can arise from a variety of openings; note the trap 8…Nxc3? 9.Qb3! Trading off the Be3 and “de-isolating” White’s d-pawn is a controversial decision. Though a bit worse, Amanov could have played 21…Na5, not fearing 22.Rxf7 Rxf7 23.Bxe6 Bxe4 24.Bxf7+ Kh8 25.Be6 Re8. Instead, White got a winning attack and Black’s king became the proverbial wandering monarch in search of a realm. After this exciting game, Howard…withdrew! He had had enough excitement for one day, and his family was waiting for the long drive home. Fortunately, after a few minutes he thought better of his decision and asked if he could get back in. With Black against Khachiyan, Howard appeared to be a severe underdog (which didn’t stop Sevillano and Matikozyan from taking that quick draw, which could have left them in a big second-place tie). He essayed a highly unusual variation of the Pirc and stood somewhat worse until Melik (a bit fatigued after a week of teaching at a chess camp) missed first the superior 19.Nf4 and then 24.Rxd5 (there’s no good discovery because of the hanging Nd7). With Black holding an imposing center, a draw was then agreed despite the 199-point rating differential. And the Chens’ drive to Washington was an even happier one! As Bryant couldn’t make headway against Konstantin Kavutskiy, this left Sevillano, Khachiyan, Matikozyan, Chen tied for first at 4½, each earning $1120. (Enrico earned an $80 bonus on tiebreaks.) Kavutskiy joined two other young masters, Oregonian Steve Breckenridge and ten-year-old Samuel Sevian, in splitting Under 2300 honors. The class sections produced two perfect 6-0 scores. 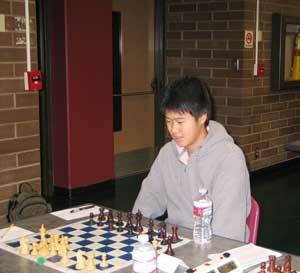 Leonard De Leon won Under 1500 by a point and a half, and Avi Jannol took Under 1300 honors by a full two points. Doing almost as well in Under 900, Julia Sevilla went 5-0 after a half-point bye. Other winners included Craig Anderson and Paul Richter, tied for Under 2100; Greg Hamer and Kevin Moy, splitting first in Under 1900; and unrated Shijie Chen in Under 1700 -- but with his prize amount restricted, Gil Magno (the Under 1500 winner last year) got the first place money, and a bit more trickled down to third place. CCA tournaments usually generate a few amusing (or instructive) stories, and the PCO was no exception. One player’s assignment of his fourth Black in the last round elicited complaints first from him, then his father, and finally his mother. She was eventually mollified by the explanation that it was a forced pairing and the opponent had just had two consecutive Blacks! And one of the Under 900 players was resourceful enough to conjure up an “almost” stalemate trick in a dead lost ending with his pawns blocked and his king unable to move. He repeatedly checked and offered up his rook, but as is often the case in such situations, the opposing king found a haven where the pesky rook could be captured in a way that released the stalemate. Conflicting details (one version on the website, another on the widely distributed postcard and verbally announced) about the Under 900 schedule led to a mercifully temporary forfeit, as the very young players (one of whom had gone to sleep) returned to the hotel and played the game. Organizers, be careful with those templates!